⇒ Don’t leave your valuables where they are visible from the outside, such as close to the window. Not only do they show a would-be burglar that there is something worth breaking in for, they can also take them very quickly with minimal risk to themselves. ⇒ Don’t have valuables on display near the front door. Burglars will sometimes try doors to see whether they’re locked and anything near the door can be easily taken. They may even pose as a legitimate caller such as a salesman or tradesman, just to get an excuse to take a quick look. ⇒ Be careful how you dispose of packaging of valuable items such as TVs, laptops, iPads and other gadgets. It’s better to take these to a recycling centre than advertise that you have these new items by putting them in your own bins. ⇒ Consider investing in a safe for expensive items like jewellery, smaller gadgets and, of course, cash. Other items such as passports and driving licences can also have a value to burglars as they can be used for identity fraud so keep these in a safe as well (a safe can also protect from fire and flood as well as theft). ⇒ Be inventive when hiding valuables. Most people still hide money and jewellery in their sock drawer, under the bed or under the sink – all places that burglars will look. You need to make it a lot more difficult than that! Ideally in a safe but failing that, somewhere that is not easy to get to. ⇒ Try not to keep a lot of cash at home if possible. 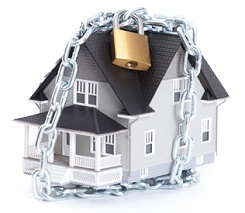 Often home insurance policies will only cover up to £500 or even £250. ⇒ Hide spare house or car keys away, preferably in a safe, so that burglars can’t return to get into your home again or take your car. ⇒ Check your valuables regularly. Sometimes thieves can break in and leave few clues that they were ever there. If you don’t check that your things are where they should be it can often be weeks or even months before you realise they have gone. ⇒ Burglars tend not to be Master Jewellers and therefore can’t always tell whether a piece is priceless or worthless. If something has sentimental value but little monetary worth you should still lock it away as chances are they will take it anyway and items like that are usually irreplaceable. Of course, all of these actions go hand in hand with general home security good practice including making sure doors are locked and the burglar alarm is set. Next week’s theme is The Great Outdoors – looking after the security of sheds, garages and out-buildings. Do you have a question about protecting your valuables? We’re answering your home security questions throughout October for NHSM so please comment to ask yours or see further details here.